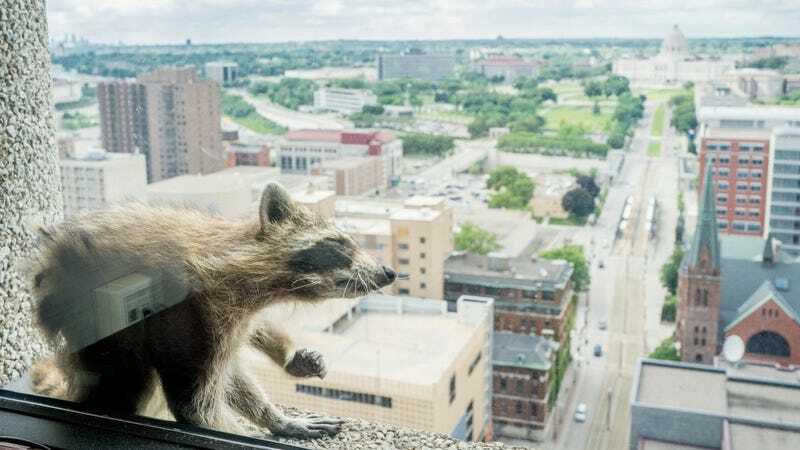 A raccoon scaled a skyscraper in downtown St. Paul, Minnesota, on Tuesday, managing to climb at least 20 stories on UBS Tower as onlookers snapped photos from outside and within the structure. Per WCCO, the raccoon was “first spotted at the Town Square building, huddled in a nook above the sidewalk,” but when building workers tried to rescue it from a potential fall, it decided to instead climb to nearly the top of the neighboring 25-story building. The raccoon has since steadily ascended UBS Tower, taking the time to groom itself and lay down along the way. Locals have deemed the animal “Spider-Raccoon,” per Minnesota Public Radio News. According to NPR, firefighters have made appearances in the building to see where the raccoon was, and city officials have set up cat food-laden traps on the roof to lure the critter to the top where it can be safely retrieved. However, as of late Tuesday afternoon, the raccoon seems to have deemed it time for some rest around the 23rd floor. Hopefully our little guy or gal will complete their ascent without harm, though as Minnesota Public Radio News’ Tim Nelson noted on Twitter, raccoons are really good climbers and more than capable of making their way back down should they feel the need to. Update, 8:40pm ET: A live stream of the raccoon is available on WCCO’s Facebook page. Update, 12:10am ET: According to WCCO, the raccoon indeed began a descent at around 11:30pm ET, “making it to the 14th floor about 15 minutes later.” Perhaps the little rascal knows exactly what it’s doing after all.